Believe it or not - its just around the corner. Looking outside today I can totally believe it. After some work at my "real " job (blech) - I'm going to reward myself with some time in the garden. 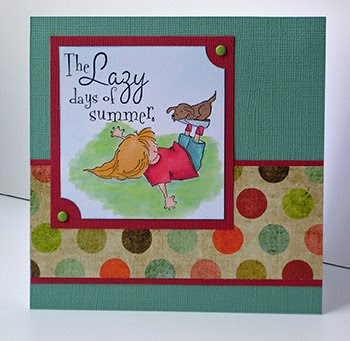 Since I'm in the summer mood, I decided to use the "Lazy Days of Summer" card kit to make a couple cards. You can see this kit as well as other ones at the Paper Garden Projects store. 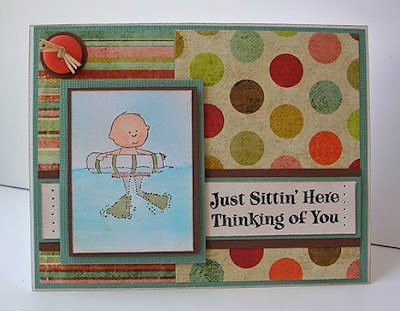 This first one is for the sketch challenge on Splitcoast Stampers. The boy is "Kyle Floats" and he is part of the stamp set included in the kit (from Eat Cake Graphics). He is just so cute! The sentiment is from Anytime Sentiments by Impression Obsession. Its a great collection of sentiments and fonts. The cardstock and papers are included in the kit. Its Bazzill cardstock and BoBunny Carnival papers. I colored the image with my Copic Markers and air brushed the sky. For me, the jury is still out on the air brush system. This is a simple little card, but I thought I'd show you the other two images in the kit stamp set. Two best pals playing on a summer day! This card was made from the kit as well. Thanks for stopping by. I hope you get some time to play outside too! So cute! I LOVE the big dot patterned paper! Wow, I'm still waiting for spring to get here! They're both fantastic! Love the images in both of them! Hope you got your garden time! This is the cutest card! Very interested in hearing more about the air brush system for your Copics. This is adorable!! Love that stamp and great coloring too! I love these eat cake graphics. I gotta break mine out again. You made some darling cards.